Mary Halsey, of West Warwick, Rhode Island, is talking about her viral karaoke performance that drew attention from Missy Elliott. A Rhode Island woman's karaoke version of Missy Elliott's hit song "Work It'' has become an internet sensation, even drawing praise from Elliott. Mary Halsey, of West Warwick, recently performed a version of the 2002 hit at an outdoor party at Goddard Memorial State Park in East Greenwich and posted the performance on her Facebook page. She added that Halsey "straight killed'' the song. Halsey's video has been shared more than 180,000 times and had 10 million views as of Friday. "It's just gone off the charts, literally," Halsey said. The 58-year-old Rhode Island woman may look like an overnight sensation but she has been perfecting her go-to karaoke song since 2003. "People wait for me. They're like, 'you're gonna sing your song, right? You're gonna sing your song.' It's my song now. Sorry, Missy," Halsey said laughing. Her song choice isn't an easy one, requiring her to sing backwards. "I'm not even sure if that really means anything but it's part of the song and I do it kind of verbatim. That's what's incredible," she said. The woman in the background of Halsey's video, bopping around and eating, also grabbed Elliott's attention. Halsey says she met the woman that day. And the instrument she's holding? 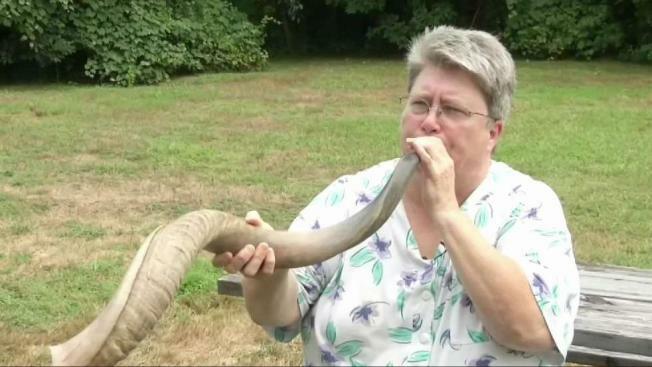 It's called a shofar. She plays that, too.